Huge residential block for the Jain Monk where carved out of the rocks of Khandagiri and Udayagiri in the first century B.C. in the city of Bhubaneswar. This caves were also an excellent canvas for the detailing of various achievement of King Kharavela’s reign. There are about 18 rock-hewn apartments at Udayagiri along, with the Hati Gumpha or Elephant cave, bearing the well-known inscription of the Kings. The Ganesha Gumpa is well worth a visit. 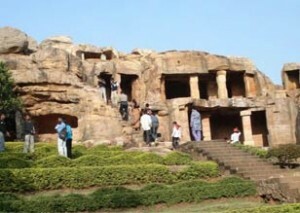 Khandagiri has also about 15 caves. This entry was posted in Khandagiri & Udayagiri, Orissa. Bookmark the permalink.